China – The World’s Biggest Tech Thief? Chinese theft of intellectual property from other countries (mainly the US and those in the EU) represents the greatest transfer of wealth in history according to Keith B Alexander, former director of the US National Security Agency. intellectual property includes such things as patents, trademarks, copyrights, trade secrets and software, and China has a long history of stealing such things ever since it opened up its economy to foreign trade in the late 1970s. China has long been known as the country of origin for counterfeit DVDs (among other products), but more recently one its largest tech firms, the phone manufacturer Huwai was accussed of encouraging employees with bonuses for gathering confidential information from competitors. The type of information stolen covers a huge range of sectors: everything from the designs for wind turbines to cars, medical devices and computer chips. In one infamous case, Germany’s Siemens introduced the high-speed train to China only to find that subsequent extensions of the system were manufactured by its Chinese partner, China National Railway Corporation, which had developed similar technology suspiciously quickly. How has China managed this? Back in day China was more likely to engage in full on cyber-espionage, but more recently it has developed a set of policies which forces foreign multinationals working in China to divulge secrets while they are forbidden similar access to Chinese companies’ information. Technically this is against WTO rules, but it seems that China, being a ‘big player’ on the international scene can get away with this. This is a great example of a ‘state crime’ – state sponsored theft of intellectual property, and it’s a great example of a crime that up until this point has gone unpunished! It also reminds us that where globalisation is concerned, there is no such thing as genuine free-trade, it’s only as free as the large nation states allow it to be. NB – as a final note, Chinese intellectual property theft might be a thing of a past, China has invested so much in skilling its population up in technology that it is likely to become a cutting edge tech innovator in its own right in the not too distant future! Would would falling back on WTO rules mean for Britain? If the UK leaves the EU with ‘no deal’, it will fall back on World Trade Organisation Rules, but what does this mean? The WTO was founded in 1995 and sets the rule book by which global trade takes place. One of the main things it has done over the past two decades is to reduce tariffs (basically taxes) levied by governments on imports and exports, and to promote a free-trade agenda. In 1947, the average external tariff charged by GATT (the predecessor of the WTO) signatories was 22%, which was a massive disincentive to trade, by 1999 it was down to 5%, and today the weighted average tariff charged by the US and EU is 1.6%. Over the same period, there has been a massive increase in world trade: In the 1950s international trade accounted for 8% of the world economy, today it accounts for 30% of a much bigger global economy. Recently, the WTO’s trade liberalisation has stalled, and most of the progress countries have made in reducing barriers to trade have been through regional and bilateral trade agreements. The European Union is a principle example of this: UK companies pay no tariffs on exports to Europe or imports from Europe, which makes trade easy. If we were to fall back on WTO trade rules, there are some economic areas which still have very high tariffs – cars and car parts would face a 10% tariff every time they crossed a boarder (making BMWs a LOT more expensive! given international supply chains) and agricultural tariffs stand at 35%. The latest Treasury forecast predicts that the UK economy would be 9.3% smaller in 15 years if we exited the EU under WTO rules. Isn’t this just all part of ‘project fear’? Of course Brexiteers argue that we could forge new bilateral and multilateral trade agreements once we leave the EU, but most estimates suggest that a no deal WTO fall-back Brexit would be detrimental to the UK economy. However, what all of the above suggests is maybe that ‘globalisation’ isn’t so good for world trade anymore…. maybe it’s too difficult to sort out genuinely mutually beneficial trade agreements between all 160 odd member states of the WTO. Instead it seems that regional agreements are much more important for economic growth – it makes sense that it’s easier to get a deal between a dozen local countries rather than ten times that number after all. To my mind it seems unlikely that we’re going to be able to negotiate dozens of little deals with specific countries that outweigh the benefits of being part of a massive trading block like the EU! The extreme right wing candidate Jair Bolsonaro was recently declared as Brazil’s president – he’s anti-gay, anti-immigrant, and anti-environment, and yet the public voted him in to take office from January 2019. He’s also strong on law and order: he’s praised former Brazilian dictatorships which used torture, among other tactics as a means of social control, and he’s promised to outlaw protest and op positional social movements. Given that Brazil is the fourth largest democracy in the world, and one of the BRIC nations, this is quite significant in terms of global politics – it probably means that Brazil will be opened up for even more deregulated trade, while the poor who suffer the consequences of this will be disciplined more harshly by the state’s security forces. In short, this is the most significant global shift towards more repressive neoliberal politics since Trump’s election. It’s something worth keeping an eye on! This comment piece by Simon Jenkins in The Guardian is worth a read (it’s short) – it blames this shift to the right on the failure of a corrupt left-wing government in Brazil to effectively maintain social order, and he also blames social media – which becomes an echo chamber for far right scapegoating and polarises public opinion. With this shift to the right, it seems that global consensus politics has become even less likely! Fashion is the second most polluting industry in the world after oil, at least according to Stacey Dooley’s Google investigation during her latest BBC documentary: Fashion’s Dirty Secrets. The program is only available on iPlayer for another couple of weeks, but what I’m going to do here is link into the people and issues covered in this excellent documentary. Fashion is a surprisingly polluting industry – the reason it comes in at number two is because of all of the pesticides, fertilizer, and not to mention the sheer volume of water it takes to make many of our most basic threads, cotton being the biggest problem, given its popularity. Check out Lucy Siegle’s writings for more info. Stacey visits Kazakhstan to witness one of the biggest human made environmental disasters in history. The country used to be home to the Aral Sea – which used to span 68K square kilometers. HOWEVER, now most of it has dried up because of dams being put in place to supply water to massive cotton plantations in neighboring countries. The region is now a desert plagued by sand storms. It takes a staggering amount of water to produce cotton… 15 000 liters to grow the cotton in one pair of jeans, for example. There’s the obligatory trip to Indonesia… where we see clothes producing factories churning out chemical polluted water into local rivers, and local slum dwellers washing their clothes in said water with strange skin rashes. This article by Al Jazeera covers the same ground. Not one single Chain store (e.g Primark etc.) accepted an invitation to appear on the show, and even the Department for the Environment gave a ‘standard reply’ not focused on fashion, but rather on their plastic bag policy, strongly suggesting all of the Corporations involved in fashion and the UK government couldn’t give a toss about the environment. Stacey did interview a few fashion vloggers, thinking that these ‘influencers’ could be a way to get consumers to switch to less polluting threads. They seemed extremely ignorant of the high environmental costs of ‘fashion as usual’, but willing to push the moral imperative to shop for more environmentally friendly brands. HOWEVER, only one of the four interviewed actually took this up on her vlog. mainly relevant to Global Development the material in this documentary is yet more supporting evidence for TNCs not promoting development, and both the Aral Sea disappearance and the river polluting factors in Indonesia are good examples of green crime. Global Warming: Last Chance to Save Planet Earth? Human activities are estimated to have caused 1.0°C of global warming above pre-industrial levels. Global warming is likely to reach 1.5°C between 2030 and 2052 if it continues to increase at the current rate. With this level of warming, the report estimates that about 4% of the earth’s surface will undergo significant ecosystems change (in layman’s terms that means some areas becoming deserts, and lots of dead polar bears in the arctic), more extreme weather conditions, and some small island communities disappearing due to sea level rise. And those in less developed countries will generally bear the brunt of the negative consequences of climate change. The report also points out that warming could be more severe, and that to limit warming to 1.5C, will involve “annual average investment needs in the energy system of around $2.4 trillion” between 2016 and 2035. Unfortunately this important update is only of direct relevance to the minority of students who study the Global Development topic. For those that do, this report puts everything in perspective: this is the ‘global challenge of the day’. However, for all students of sociology it’s possibly a good reminder of the limits of optimist globaliszation. Globalization has gone so far that we’ve effectively got a global consensus that climate change is taking place and that it’s man made. HOWEVER, we’ve actually known this for decades, but still nothing significant is being done about it, because those who occupy the seats of global power don’t see it as being in their current interests to actually take the necessary large-scale action (i.e. make the massive investments now) to reduce the risks of global warming. Of course, if you’re a hard line neo-liberal risk society theorist, you might just see all of this IPCC stuff as scare mongering, nothing to worry about, and remain confident in the fact that the planet can handle the shock, and that techno-solutions will be found at some point in the not too distant future. Despite being a third world country, as judged many and varied social indicators of development, America is set to spend $8 billion on a new ‘space force‘ over the next 5 years. China and Russia are currently competitors for military advantage in space, and it seems this has got America worried. In 2007 China successfully shot down one of its old weather satellites, orbiting 500 miles above the planet. In 2015, Russia launched a successful test of an anti-satellite missile. Some television and video conferencing. It would seem that satellites have somehow become the ‘foundation’ of our daily postmodern, globally networked lives. Besides firing missiles into space, there are other options: lasers could be used to blind or dazzle satellites in order to disrupt their functionality, or cyber attacks could be ‘launched’ to hack into them. As with most things warfare, it seems that the USA is already years ahead of its competitors. The USA first launched a successful strike against an obsolete satellite in the mid 1980s, and they are already ‘hardening’ existing satellites against attack – by positioning redundant satellites to act as back ups, for example, and they are looking into giving them their own defensive capabilities. What are the possible consequences of Space War? If there was an all-out space war, it could create a debris-cloud which would render space unusable for future generations, however, if global relations deteriorated to this point, we’d probably be more worried about the radiation sickness from the previously deployed nukes! Quite a useful example of the continued power of the Nation State in a global age…. seriously, how many nations have the power to shoot down satellites…. really just a handful, and no other body besides them! The Week, 25 August 2018. What is the significance of the ‘increase’ in student suicides? There has been an increase in the suicide rate among Higher Education students, from 3.8 per 100, 000 in 2006/07 to 4.7 suicides per 100, 000 in 2016/17, according to new data released this week by the Office for National Statistics (ONS). NB this isn’t only the latest data, it is also ‘new’ in the sense that this is the first time that the ONS has published data specifically focussing on ‘higher education student’ suicides, so in this sense I guess it is inherently news worthy, and the release of the data on the 25/06 certainly caused quite a stir in the mainstream news and talk shows following the release, with the main focus seeming to be on ‘what we should do about the problem of increasing student suicides’, and the fact that this is ‘new data’. However, to my mind, while I appreciate the fact that there is an underlying increase in students reporting mental health issues that seems to correlate with the increase in suicide, I also believe there’s reason to be sceptical about the usefulness of the above data, especially since the ONS itself refers to these stats as ‘experimental statistics’. Below, I summarise what the ONS data tells us about HE student suicides, and then contrast two sociological approaches to interpreting this data: the first being a broadly ‘structuralist’ perspective which accepts that the data is basically valid and asks ‘why are there more student suicides?’ (which was pretty much the narrative in the mainstream news); and a second, broadly Interpretivist approach which questions the validity of this data, and asks whether or not all of this might be something of a moral panic? However, although the data appears to have stabilized in the the last three years, the ONS reminds us that these rates are based on such low numbers (95 suicides in 2016/17) that it’s hard to draw any statistical significance from these figures. Between the years of 2001 and 2017, a total 1,330 students died from suicide, of which 878 (66%) were male and 452 (34%) were female. This actually surprised me a little (note to self about ‘stereotypes’ of suicidal students): higher education students aged 30 or over are twice as likely to commit suicide compared to students aged 20 and under. I recommend checking out the publication (link above and below at the end) by the ONS, they mention several limitations with this data: for example, the low overall numbers make it hard to draw any conclusions about the suicide rate with any degree of confidence (statistical significance); and the year on year on year data might not be accurate given delays in recording a death as a suicide, due to inquests taking a long time in some instances (e.g. a suicide which happened in 2016 might appear as a recorded suicide in 2017). What are the underlying ’causes’ of the ‘increase’ in student suicides? The suicide stats are the ‘extreme ‘tip’ of something of a ‘mental health crisis’ in universities – higher number of students are making use of mental health services, which are under-resourced: universities aren’t giving enough support to vulnerable students who are suicidal. The increase in mental health problems/ suicide could be due to the fact that university life has become more stressful: there’s more pressure to succeed and get at least a 2.1, and students no longer go to university to have ‘three years off’ (like I did ;)). Related to the above, mental health problems could be related to the ‘double adjustment’ (my invention that!) students have to go through: they have to adjust not only to the fact that university life isn’t as much fun as its been made out to be (at yer glossy open day), and they have to adjust to the fact that they are just not ‘that clever’ (the later probably applies more to hot-housed privately schooled students, and to those students who are more likely to have had their predicted grades inflated). Interpretivists would be much more likely to question the validity of these stats, and thus the validity of the view that there is an increase in higher education student suicides, and the opinion that this is something which we should be concerned about. If you were to compare the three year average for 2002/03 to 2004/05 with the three year average for 2014/15 to 20016/17 the ‘increase’ is much less significant. The ONS itself says you cannot draw any significant conclusions from the small numbers used to derive these stats. And again, they even explicitly refer to them as ‘experimental stats’! The overall number of student suicides is half that of the suicide rate in the general population: surely the headlines should be: ‘”great news, going to university helps lower suicide risk”? There might also be an argument to made that this is something of a moral panic: it seems to me that the media perpetuate the idea that the typical suicidal student is a 19 year old female, when actually this is atypical – a 30+ year old male student is about 4 times more likely to kill himself. So, might this uncritical news reporting just really be about stoking a moral panic not so much about the ‘increase’ in higher education student suicides (of which there appears to be no significant evidence), but really about the increase in suicide among our ‘precious’ middle class male students? All pic sources from the ONS or screen captured. How do we explain the 500% increase in prescriptions for Cow’s Milk Allergy between 2006 to 2016? You can watch the documentary on BBC iplayer until Late June 2018, although TBH you may as well save yourself 50 mins and just skim read what’s below. There has been a dramatic increase in prescriptions for children with Cow’s Milk Allergy (CMA) in recent years: A 500% increase in the 10 years to 2016 in fact! A ‘prescription’ basically means that children with CMA get put on a specialist cow milk free ‘alternative milk’ formula, which costs twice as much as regular milk formula for children, and costs the NHS £64 million/ year. In this section of the second episode of the series: ‘The Dr Who Gave Up Drugs, Dr CVT asks why there has been such a rapid increase in prescriptions for specialist formula to treat Cow’s Milk Allergy. He says that as a new parent, he keeps hearing about it, which is odd because only 2% of children suffer from it, and so he’s wondering whether or not the above increase in prescriptions is due to increase in the underlying numbers of children who actually have cows milk allergy (or better detection) or whether there is something else fuelling the increasing public awareness of the condition. The documentary also visits one parent who thought her child had CMA when he developed XMA (one of the possible symptoms, but also something which 20% of babies suffer from), she visited her GP, who confirmed he didn’t have CMA. However, when she took her child to hospital for a bump, the pediatrician there noticed the XMA and prescribed specialist formula for CMA. The child hated it, and so often went to be hungry. It too a visit to a Dr Robert Boyle (in the skeptical about CMA camp) who confirmed the child didn’t have CMA and so normal milk service was resumed. The worrying thing about the above case is that alternative formula is being pushed on parents against their will, the normalisation of the diagnoses and treatment for a condition which in this case didn’t actually exist. One of the reasons Dr CVT is sceptical about the increase in awareness and prescription being linked to an actual underlying number of cases of children with CMA is that a lot of the education provided to Doctors about food allergies among children is sponsored by the companies who make alternative, specialist formulas to treat allergies. 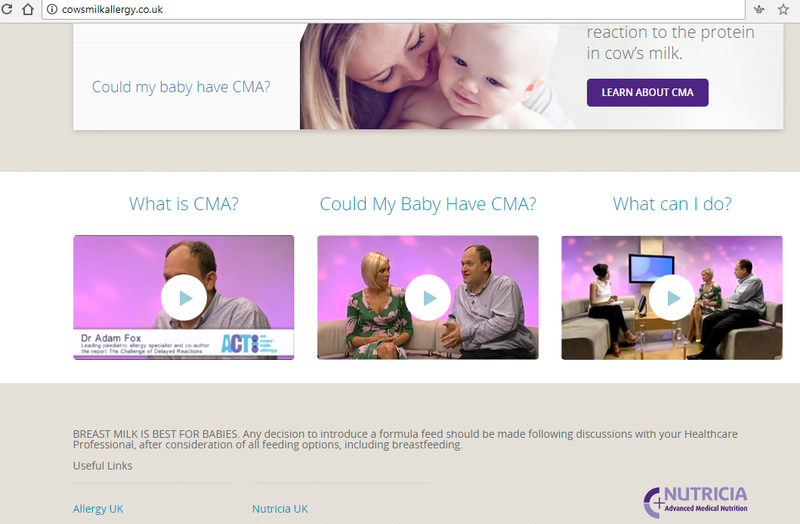 To illustrate this point, the documentary visits a training day for NHS staff in Newcastle, aimed at educating staff about food allergies in babies – the event is sponsored by Danone, the company which makes one of the specialist CMA formulas, and what Dr CVT finds is advertising literature (various ‘glossy mags) and product samples alongside proper medical advice. Another ‘test’ for the involvement of industry in educating about food allergies is to simply Google ‘cows milk allergy’ – which Dr CVT does and finds that most of the advice websites which help parents to self-diagnose their children are run by the companies who make specialist formula to treat the condition. Finally, he interviews Dr Adam Fox, who is a consultant for the ‘Allergy Academy’, sponsored by Danone, and he doesn’t seem able to convince Dr CVT that there isn’t a conflict of interests between the companies who profit from increased diagnoses of Cow’s Milk Allergy providing education on how to diagnose for the condition. There are lots of applications – mainly centering around labelling theory and the power of corporations to shape agendas! Also risk society. screen capture, BBC from documentary above. I won’t produce the exact questions below, mainly because I haven’t actually seen the paper at time of writing, just the gist.. I would have gone for two very general ‘ways’ and then expanded on them…. Secondly I would have used Fundamentalism as a reaction to secular globalism. Minority ethnic groups arriving with a different culture from the host society – you can apply Weberianism and cultural transition theory to this. Members of minority groups facing racism… developed using the cultural defence theory, possibly using Pentecostalism as an example. You could also throw in some Marxist analysis to beef it up. Postmodern explanations of organised religion – doesn’t FIT PM society! Highlight what NAMs do that Organised religion used to do… (arguing for the view in the question) – e.g. Conclusion… it isn’t replacing organised religion and that’s a god thing? I won’t produce the exact questions below, mainly because I haven’t actually seen the paper at time of writing, just the gist…based on what some of the students said immediately afterwards. Check back tomorrow for the updated, more precise version! So NB – the actual questions may have been slightly different! I would have gone for two very basic ‘topic based’ areas to start: something about aid and improving women’s health and the knock on effects, and then something about women’s education, linked to work. Q05: Analyse two things to do with cultural globalisation. Obviously I need to see the item to comment fully, but I’m going to assume that the item allows you to develop one point using optimism versus pessimism and then another contrasting transformationalism with traditionalism. Easy: just use this plan, obviously modify according to the item! NB – It’s a bit weird having to do this blind, but please do check back later tomo for the new and improved updated version, and a few comments on the good ole’ families and households section.